Sometimes there is no better way to relax then to kick back and enjoy a pint. And of course, that pint of delectable beverage can not only taste great, but look great too, when you enjoy it out of a new Game of Thrones Tyrell Sigil Pint Glass! This way, you can seemingly have your cake and eat it too, as you can have a great collectible from the Game of Thrones series, celebrating your favorite house, while also enjoying your favorite beverages out of this collectible glass. The glass predominantly features the sigil of House Tyrell emblazoned on its surface. This sigil consists of the house emblem, depicted as a golden yellow flower petal, as well as the house motto, which reads as GROWING STRONG. As its name implies, this pint glass holds a pint of fluid, making it a great choice to use when you are looking to satisfy a truly impressive thirst. On its own, this glass is a great way to show your support for House Tyrell, and when paired with other Game of Thrones collectibles, it makes for a fantastic addition to any collection too. Give this glass to any Tyrell supporters you might know among your family and friends to really show you care, or keep the Game of Thrones Tyrell Sigil Pint Glass for yourself so that you can enjoy this great collectible in the comforts of your own castle. 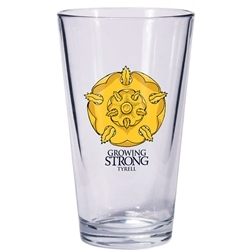 Our Game of Thrones Tyrell Pint Glass is a 16 oz. two-color glass that has an imprinted with the Tyrell emblem, ready for a beverage that will light your fire. Sold unpackaged.